Jeffery Kissoon is one of those performers whose closely guarded privacy can’t hide a fantastic and well-established career. His work spans Shakespearean and modern theatre through to television and film drama. Either behind the scenes, directing, or performing on stage, he has paid his dues over a successful four-decade career. His recent performances in the Talawa/West Yorkshire Playhouse production of Waiting for Godot were well received and we can expect to see him again on the big screen in the just completed independent film Ham and the Piper, directed by Mark Norfolk. For the next few weeks, Kissoon will be appearing in the Royal Shakespeare Company’s production of Julius Caesar at London’s Noël Coward Theatre. This most famous of the bard’s political thrillers opened at the Royal Shakespeare Theatre in the playwright’s Stratford birthplace in May. But the current version draws parallels with contemporary African politics as part of the World Shakespeare Festival celebrating the London 2012 Cultural Olympiad. The play was also recently televised for the BBC’s Shakespeare Unlocked season. When I spoke with him recently he explained why doing Shakespeare in such a high profile production, is not a climax to, but rather a continuation of his first steps into acting and performing. 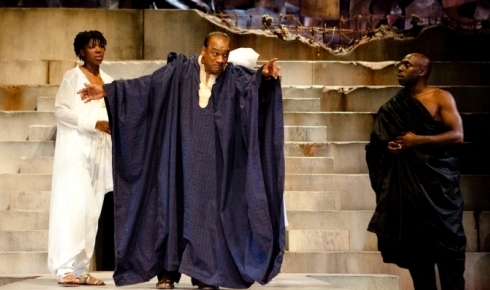 With so many interpretations of Shakespeare’s plays, this particular rendition directed by Gregory Doran, sets the story of political intrigue and assassination in an unnamed African country, and employs a pan-African ensemble of highly experienced performers. Kissoon in the title role is joined by stage and screen stalwarts such as Paterson Joseph [Brutus], Cyril Nri [Cassius], Ray Fearon [Mark Antony] and Adjoa Andoh [Portia]. Linked with the recent news that Nelson Mandela and his fellow political prisoners drew inspiration from a banned but secretly distributed Collected Works of Shakespeare, Kissoon described his pleasure at participating and what this production tries to achieve. Because he has accumulated the wisdom borne of experience and age Kissoon is well-qualified to talk about the frustrations of Black performers, especially in terms of the support from a diverse Black community, which is not the same now as it was during his formative years in Britain. In modern day Britain those with Caribbean or West African heritage are joined by many others from the North, South and East of the continent. He has touched on a frustration often expressed, but with the likes of Bola Agbaje, Roy Williams, Dipo Agboluaje, Kwame Kwei Armah and many others excelling in the theatre as playwrights there doesn’t seem to be any lack of support, and Kissoon concedes that when it comes to the work he chooses quality first, but is not ashamed to emphasise the emotional and cultural connection between the performers and their audience. The actor discovered drama, acting and performing soon after coming to London from Trinidad with his parents, he got his first break in 1970 and hasn’t looked back. Although he trained and expected to become a drama teacher - and he still tutors and mentors young actors - he has appeared in numerous screen and stage roles ever since. For someone with such extensive experience, and a trip to Russia rounding up the global leg of this year long tour to look forward to, he’s still enthusiastic for the work. Shaun Ajamu Hutchinson is The New Black Magazine's arts editor and a London-based freelance journalist.